MINI LOVE STORY VOL I - 25g NEW!!! Volume I" presented to you by Basilur. Pure Ceylon Green Leaf Tea together with natural sufflower, cornflower and the sweet flavour of Bergamot will add an extra spark and create a natural chemistry between you and your loved one. 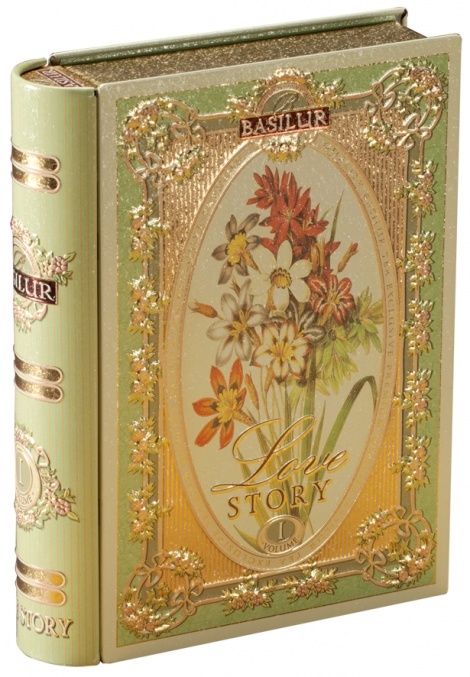 This "Love Story" tea book is a gift which could be given with love. A gift which will say many more words than you could express. Share the warmth of this delightful tea as you snuggle during chilly winter nights, or as you watch the sunset during an enchanting evening in the summer. Create memories which will last a lifetime while you satisfy your senses with a warm cup of this magical tea. This gift of love presented by Basilur is a perfect gift, a perfect blend and a perfect message of love with Ceylon's finest tea and Basilur's unmatched expertise. Ingredients: 100% Pure Ceylon green leaf tea with Bergamot (Earl Grey) flavour.